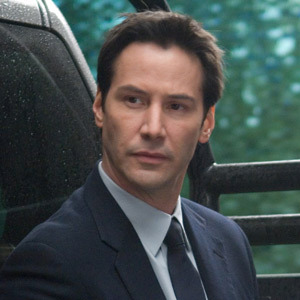 In the movie The Day The Earth Stood Still, Keanu Reeves (in photo) is an alien who becomes the friend of astro-biologist Helen (played by Jennifer Connelly). Jennifer Connelly had long been an admirer of the science fictionclassic The Day The Earth Stood Still and when she received a script fora re-imagining of the film for a contemporary audience she was immediatelyintrigued by the possibilities of working on "such a great story" alongsideKeanu Reeves. Directed by Scott Derrickson (The Exorcism of Emily Rose), withKeanu Reeves as Klaatu, Connelly plays Helen Benson--played in the original byPatricia Neal--a scientist who befriends the alien when all the other humanstreat him with a mixture of suspicion, aggression and fear. Helen is an astro-biologist who is part of the team that is called into interrogate and analyze Klaatu after he lands on Earth. She's also a singlemother who can see beyond the obvious scientific interest in him as a‘specimen' and connects with him on an emotional level. When he escapes from his captors, he meets up with Helen and her youngson Jacob, played by Jaden Smith, who give him shelter as the increasinglyanxious authorities try to track him down. In the new film, Helen plays a farmore active role in the story compared to the original. Question: The story in the original is dominated by the threat thatmankind is about to destroy itself with nuclear war. How has the story beenupdated? Answer: Our film has been updated on a number of levels. The originalwas very much a film of its time that really spoke to the political climate of1951, and it largely focused on the issues of the Cold War era and theproliferation of nuclear weapons. Now it's the threat of violence but also theway we are living on the planet, the way that we treat each other and the waywe treat the Earth. It looks at the fact that as a culture, it's notsustainable to live like this on a number of levels. So I think the moviespeaks to us now in terms of the crises we face. Q: Jaden was very good in Pursuitof Happyness. Is he good in this? A: He's lovely. I think itwas a hard line for Jaden to walk because Helen and Jacob have a relationshipthat is complicated and I think Scott Derrickson [the director] wanted to usethat to serve as a kind of microcosm for Klaatu. It's hard to play a kid who isa bit bristly with his parents and yet you still love him and you get whereit's coming from. I think it was a little bit complicated and it's to Jaden'scredit that he managed to do that in such a convincing way. He is really good. A: I think he wasabsolutely marvelous as Klaatu. He is so hard-working and so devoted to hiswork. He cares so much about what he is doing and I found it really moving interms of the extent to which he cares about everyone and the way he works andpushes himself. He's incredibly polite and incredibly professional, and so kindto everyone on the set. Jennifer Connelly was born in Brooklyn and first acted as a child,memorably making her film debut at just 13 years old, playing young Deborah inSergio Leone's gangster epic Once Upon A Time In America. She went on tostar in George Lucas's fantasy film, Labyrinth. After studying Englishat Yale and Stanford, she resumed her acting career with films including careeropportunities, Mulholland Falls and Inventing The Abbotts. Herother credits include Waking The Dead, Requiem for a Dream and ABeautiful Mind, playing Alicia, the wife of tortured mathematics geniusJohn Nash, a searing performance which would earn her the Oscar for BestActress in a Supporting Role. More recently, her films have included House of Sand and Fogwith Sir Ben Kingsley, Blood Diamond with Leonardo DiCaprio and ReservationRoad with Joaquin Phoenix. The Day the Earth Stood Still opens December 11 in theaters nationwide from20th Century Fox to be distributed by Warner Bros.